I WATCHED OUR THREE-YEAR-OLD play out 2010 with a combination of story-telling and touchscreen tapping (see below). And in between, three generations of the family watched part of 2010 unfold on the television screen as the DVD player showed 30 minutes of clips shot through the year. The Nokia N8's footage looked superb. The Flash file might not play so I'm including a track from Fever Ray that I like. Happy 2011. Listen to Fever Ray on Soundcloud. I'M THANKFUL FOR DOZENS of free applications but the top five services that I use have often resulted in clever and inspirational work from my creative multimedia students in Tipperary Institute. While reading responses to a Media Writing examination, I learned that Dropbox and Google Docs were the most helpful, in the minds of first year students. I use those tools daily. I also sync important business information to several devices by using Evernote. I often push content from my account on Twitter to Instapaper for reading at a later time. And I let blog posts simmer until ready in draft form with Simplenote. I thank my lucky stars for each of these five free applications running on both my laptop and iPad. At this stage, my touchscreen publishes to my blog. In the second stage, it syncs with any changes I make. Those changes appear in my Simplenote account on my W7 laptop and through my iPad app as well. Journalists might enjoy this Simplenote list-keeping system. I think it is very useful for ticking off reminders, creating a collaborative shopping list, transcribing meeting notes, holding blog posts in draft format then emailing them directly to a blog like I did in this instance, brainstorming, keeping the digital version of a paper journal, making a list of restaurants, copying and pasting travel arrangements or working with any kind of flat text file. Sent from my iPod using O2-Typepad mail2blog service. 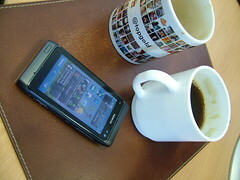 I USE A NOKIA N8 as my primary phone for several important reasons when compared to both Apple and Android handsets. Regular visitors to my blog know I spent most of 2010 with a SonyEricsson Xperia X10 as my main phone. Besides the X10 Android phone, I'm also putting iOS4 to good use in my daily life. But the phone that I trust to snap the best images, record the highest quality audio, handle textual conversations, alert me when push mail arrives, take calls, listen on IM and manage an extensive list of contacts is the Nokia N8. I doubt that my faith in the N8 will convert anybody back from either the iPhone or Android ecosystems because the world has gone very app-heavy this year and Nokia's Ovi Store is a weak entry in the space. Plus, the N8 isn't designed from the ground up to be a touchscreen device because Symbian isn't optimised for a tap-and-do operation. However, Nokia does some other functions better than anyone else and as it turns out, I need those functions more than I need the latest new touchscreen application. Let me explain. I AM A LATE ADOPTER to the iPad, mainly because I don't like feeding the Apple ecosystem while my actual spending power declines quarter-by-quarter. But Tipperary Institute loaned me an iPad and I've seen some important enhancements in learning that the little device enables. In my hands, the iPad increases my reading speed threefold when compared to paper copies and by a factor of five when compared to a mobile phone's touchscreen. That feat alone spells business productivity. But another thing has occurred right under my feet. I'm watching preschool children take to the iPad like it was a handheld Dora adventure. They don't merely consume video, although I've ripped dozens of Dora episodes onto the iPad for them. They use the iPad to develop hand-eye co-ordination, enhance memory skills, and build self-esteen. I'm no learning psychologist but I'm an observant father and third level lecturer. These positive outcomes are occurring and my major concern is the boredom the touchscreen generation must feel when they fall into a 20th century primary school classroom. That's a problem for another day. Watch on YouTube or browse my iPad shots. 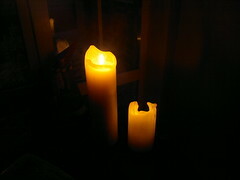 I recorded the short video clip with the Nokia N8. SEVERAL OF MY AMERICAN friends have moved back to the States because the Irish economy has changed dramatically in the past three months. Business analyst Damien Kiberd places a lot of blame on the Irish finance minister under the headline "Lenihan has dug us all into trouble." Kiberd is scathing. "Lenihan's obsessive belief that the State should pay all the cost of supporting a banking system, whose problems have themselves been magnified by his actions, has brought the state itself to the verge of bankruptcy. He has ignored what should be the first principle of any government: it is that the duty of political leaders is to preserve the state." Today, Irish sovereignty lies with EU/IMF taskmasters who have set up a payback schedule that will penalise an unborn generation. IT SEEMS LIKE ANOTHER year has passed because green grass has slowly returned to Ireland. We drove down a track of compacted snow between Weston Airport and Celbridge with 2FM telling us it was even better than the real thing. Then after I used the YouTube uploader on my Nokia N8, YouTube told me I was probably dealing with copyrighted material. Let's see how long the embed code works for the video. Paul McGuinness normally pulls down these pieces of content. Sent mail2blog using Nokia N8 O2-Typepad service. ON OUR LAST ARCTIC adventure to Drogheda, I used half a box of Persil to get traction up the hill from the cousins. Last night, with the car sunk two inches into frozen slush, we decided to spend the night 450 metres up the hill in Windsor Lodge. 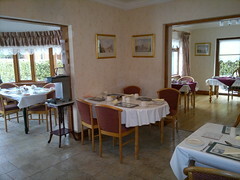 I was surprised to find the B&B open on Christmas because two other Drogheda hotel we've used before were locked down. I used a warm fire and a comfy armchair to read The Checklist Manifesto, had an over-sized Irish breakfast and then decided to push off for southern climes after reading Jonathan Grimes pronounce the Boxing Day Thaw on Twitter. After a warmer room than we have at home, we decided to return to Windsor Lodge as early as next month. We expect to be joined by more surgeons next time. Photo shot and blog post sent from my Nokia N8 using O2 Typepad service inside Windsor Lodge, The Court, North Road, Drogheda, Co. Louth, Ireland. +35341 9841966. YOU GET AN IDEA that Twitter is as universal as Christmas when you see the trending tickertape roll past a screen. Christmas is trending in many languages today. YOU CAN'T BEAT the view of Christmas as seen through a toddler's eyes. And that's what we have enjoyed today as Christmas Day unfolded before Mia in our sitting room. I captured the special moments on my Nokia N8 and I'm sure those seven minutes will be precious memories for Mia as she tries to remember the first winter wonderland Christmas she enjoyed. It's white outside and every tree is shrouded with white fur from last night's freezing fog. Our ground floor bathroom has frozen water in its pipes so we're dumping 10 litres at a time into the toilet's cistern. Fortunately, both the kitchen tap and the main water supply to the heating system still works. And so does the car so we're off to County Louth to compare stories with the cousins, watching Christmas unfold all over again later today. We're headed to Drogheda, likening it to "the little town of Hemlebeth". And on the way up the motorway, I'll listen to a story shared by Ted Nguyen of a Vietnamese family who escaped to the States in the 70s. That family joined a group of people that I knew while teaching English as a second language in California in the late 70s. Bonus: Photos from my Christmas in Ireland.